Your best weather image. Australia's favourite calendar. Calendar images feature in national media, including the Today Show on Channel 9, The Australian, The Huffington Post, Australian Geographic, Channel 10 and the ABC. Photos from left to right: Mieke Boynton Photography, Rob Embury—Pale Blue Dot Photography, Leanne Osmond. We thought you would like to know there are only a couple of months left to enter your best weather photographs in the Bureau of Meteorology Australian Weather Calendar photo competition. The winning images are published each year to great acclaim in the Australian Weather Calendar. A beloved Australian tradition for more than 30 years, the highly popular calendar (large format art reproduction on high-quality paper) hangs in homes and businesses around Australia—and in more than 80 countries around the world. Its keenly awaited release in early November generates national and international media and social media coverage, and featured photographers, many of whom give multiple media interviews, report that the exposure is great for their careers. It's free to enter, and photos taken in any year are eligible. Amateurs and professionals alike have been winners—our judges look for artistic merit, technical skill, and authentic and striking depictions of Australian weather phenomena. The competition closes on 31 March 2017—head to www.bom.gov.au/calendar/contest for entry instructions. If you want to check out this year's winners, the 2017 calendar is still available from shop.bom.gov.au—but be quick! Download the flyer in case you'd like to spread the word—please email it around or print it for your community noticeboard. Copyright © 2017 Commonwealth of Australia (Bureau of Meteorology). Please refer to our copyright notice relating to the use of the information from this email and the Bureau of Meteorology website. Read our privacy notice regarding how your personal information is managed. To receive a text copy in the future click here. I circulate for your club's information here a predominantly Nature & Wildlife photography competition advised from Italy. Details are below or further information is at www.oasisphotocontest.com. Our magazine promotes every year the International Prize of Nature Photography Oasis Photocontest, with a total money prize of 30,000 Euro. Therefore we ask you if you can communicate this event. Entries close February 28, 2017. In attachment and following you will find the press release of our contest. I'm a at your disposal for any further information. 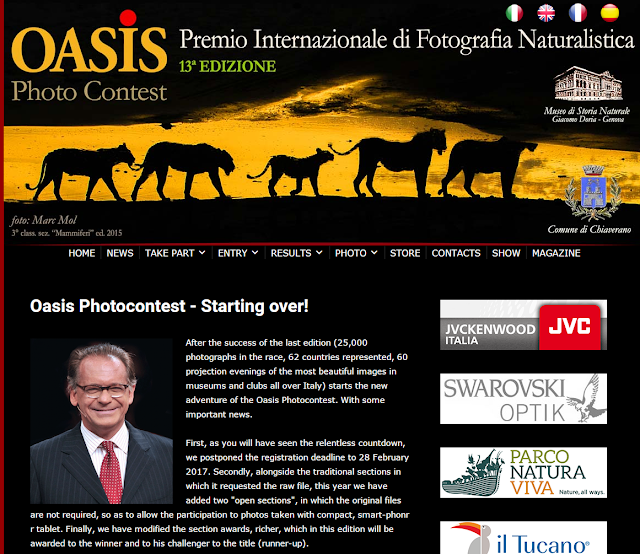 Is now open the new edition of the International Nature and wildelife photography contest - Oasis PhotoContest 13ª edition, www.oasisphotocontest.com) organized and promoted by Oasis magazine and AITN (Italian Nature Tourism Association). The winner will be awarded a prize of 2,500 Euros and the Michele Vitaloni's sculpure. Also the prestigious Oasis Magazine prize of 1000 Euros. Ten prizes of 800 euros to the winners of the 10 sections of the adult category. The contest have two sections (adults and children) and 10 categories. The best photos will be included in the prestigious catalog and will be part of the exhibition "Oasis Photocontest Tour 2017", which will shows in most important cities of Italy. The event was attendet by over 450.000 in past year. The photography competition the whole world is coming to love! Get ready for the biggest FiPP of all! Now that 2017 has finally arrived, the organising committee of the Fremantle International Portrait Prize (FiPP) welcomes all photographers, amateur and pros alike, to vie for one of Australia's fastest-growing photography awards. It's a whole 'new-look' FiPP too. As you can see from the information below, the New Year has rung in some important changes. Check our website and Facebook regularly in the lead up to the June 12 kick-off of this year's competition. For those new to FiPP, we're a not-for-profit group (based in Fremantle in Western Australia). We run an ethical, worldwide competition every two years to find the World's best digital portrait photograph. This is the fourth event and each time participation has grown in leaps and bounds. Oh... and we also donate whatever entry fees we receive that we don't need to keep FiPP going to charity. Currently our beneficiary is Arthritis and Osteoporosis WA, a very worth cause indeed, given that 60% of all of us will suffer from some form of AO in our lifetimes. (There are links to AOWA from our website so you can see the fantastic work that they do in our community). You be the judge. FiPP2015 winner Steve Wise (pictured) puts down the camera and picks up the marking pen for this biennial! Joining him is Australia's first ever female AiPP (Australian Institute of Professional Photographers) Grand Master, Lyn-Whitfield-King! And rounding off the panel (and adding a different artist's perspective) is uber-sculptor Greg James! Check them out HERE! Camera or phone. Take your pic! Come on, you know you like it! Facebook will play a big role in this year's FiPP so make sure you like our page to see our regular posts. Our website will also carry important news and, of course, provide all the rules and regulations you'll need to successfully enter the award. Entry fees for FiPP2017 have been set at $20 per image for the 'open' FiPP and $10 for the mobile-phone-only section. You are receiving this email because you were a subscriber to a former edition of the Fremantle International Portrait Prize competition mailing list at some stage (the award has been held in 2012 & 2013 previously). Just a quick note to confirm that your photos for display that weekend, in the interest of uniformity, should be A4 size. All photos will be reviewed for entry to the VAPS Interclub competition and successful entries may receive a financial subsidy to assist in the cost of printing and matting a larger print. Any other print you wish to be considered for inclusion in the VAPS competition should be presented at the Feb. 8th club meeting. Happy New Year to all members. May we all enjoy a 2017 filled with good health, happiness and fine photographs. Re the club's exhibition on Jan 28/29, will all members who wish to exhibit please deliver 6 photos to the Community Bank by Jan 23. They must be your work but can be previously exhibited. Check your email for a copy of the roster for the exhibition which you kindly completed at our Christmas function. If anyone can assist with the set up at 3 pm on the Friday please let JohnC know. So far only 3 of us setting up. We assume that the above photos will be your best work and can then be considered for entry into the VAPS Interclub competition. This will mean that your photos will not be returned to you immediately after our exhibition. Any other photos you wish to be considered for the VAPS Interclub Competition should be brought to our first meeting on Feb 8. All photos will then be assessed for entry into the VAPS competition. 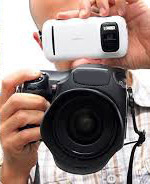 For those members who do not know how to mount photos, the club is prepared to assist. The club intends to enter the digital section of VAPS InterClub as well as the print and further details of those requirements will be given later. We also assume that all prints submitted are available in your archives as a digital image. Thus all the prints also represent the digital image and from the total number of prints, 15 prints and 15 digital images will be selected.